There is something absurd which has been recently observed over Infibeam, which says that Nokia 500 is available at the price of Rs. 9524 but this number is something totally vague. Now let us talk about the specifications for this device and I am sure that you will also feel the same. 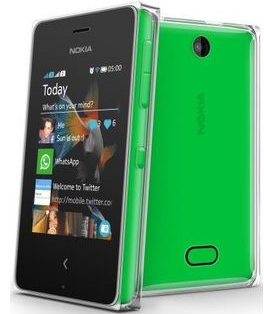 Nokia Asha 500 comes with the primary camera of 2MP and there is no secondary camera on the device. Moreover the display size of the device is just 2.8 Inches and that too with the resolution of 320 x 240 pixels. The Nokia Asha Software which is customized version of java, has been upgraded and used on this device. It will come free with the 4GB Internal Storage card and the memory allocated to RAM is 64MB which is enough to make sure that the device does not lag. Other connectivity features include Bluetooth 3.0, 2G and WiFi 802.11 b/g/n. In other words this device has everything being downgraded from Nokia Asha 501 except the software version. I seriously understand this as a mistake because Nokia Asha 500 at this price is not justified at all because nobody will leave Karbonn Titanium S5 Plus or Micromax Canvas Juice A77 to go for this device. We will let you know if any update comes on this section. NOKIA ka dimag kharap ho gaya hai, Isme yesa kya he jo 9k ka price hai? Going to be a big failure …..
dont worry, it wont sell at that price, but the actual price is going to be lesser than MRP. Yes, the same has been corrected, thanks for pointing out.